The way we present ourselves is important, particularly in the business world. Going into work with a wrinkled blouse or sending your husband to work in a rumpled dress shirt simply won’t do. Ironing is the answer for making clothes exude the kind of confidence we want to feel deep within ourselves. In order to iron properly though, it takes the right ironing board. If you think that the type of ironing board you choose doesn’t matter, then keep reading. Ironing boards have different sizes and features, some of which could be problematic for your needs. 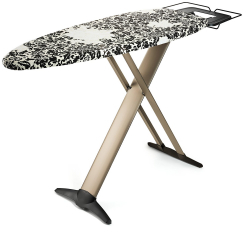 Choosing the right ironing board is important for making the task of ironing a breeze. 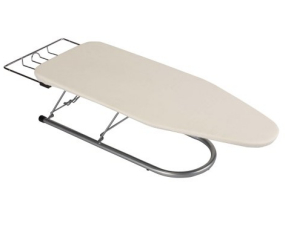 One of the reviewers called this ironing board the “Lamborghini of ironing boards.” That a fairly accurate description. This ironing board by Brabantia is 49 x 15 inches. The frame is .89 inches in ivory. 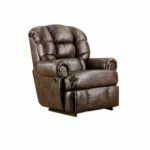 It’s an extra-wide set up for ergonomic functionality and has the ability to adjust to four different heights ranging from 30 to 38 inches. Some of the features of this ironing board include a transport lock. This keeps it from accidentally opening while stored or during transport. It is also equipped with a child safety lock so that small children can’t collapse it onto their little fingers. Guaranteed for 10 years, it provides a steam iron rest that works with standard irons. This feature helps you from accidentally knocking the iron down when it’s not in use. The 100% cotton cover has a cord binder as well as a stretch system to keep it in place and keep it firm, ensuring that ironing is a smooth experience. One of the major upsides of this ironing board is that it has a larger working area. That means you can iron entire large items in one fell swoop which will make getting things done go much faster. At 14.3 lbs., it’s not excessively heavy but has enough weight that you can feel confident when you iron. It’s not flimsy and can really stand up with you for all the ironing you do. The safety features make it a great choice for parents with small children. It’s thoroughly up-to-date for your needs in 2017. Bartnelli makes this large ironing board, sized at 51 x 19 inches. Made in Europe, it features a multi-layered board that is covered with a layer of extra thick 100% cotton. Beneath the cotton, foam and felt layers add extra padding to make for easy ironing. These layers can stand up to the heat of your iron and also prevent your clothes from sticking. Go further under those layers and you’ll find a mesh metal top which allows steam to pass through uninhibited. In addition to an extra large ironing area, it features the ability to be set in 4 different heights ranging from 30 to 38 inches. It also comes with safety features including a steam iron rest to prevent your iron from falling off the board, a safety lock to keep it from collapsing accidentally, and a transport lock to secure the folded ironing board while it is being stored or transported. The feet provide protection from your floors and the metal components of the board are anti-corrosion. This one stacks up very well thanks to the larger work area. Modern design for 2017 makes it a prime ironing board choice. Where it falls short though is that it is heavier at 20.2 lbs. This ironing board comes with a 3-year guarantee which is nice, but not as long as the Brabantia model. 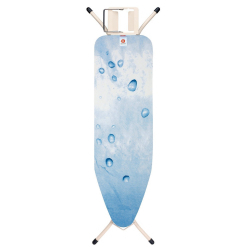 Keep your ironing tasks simple with this ironing board by Real Simple. The sturdy 15” x 54” board surface allows for plenty of room to iron even larger items. The extra thick pad cover helps make ironing a breeze. Equipped with a sturdy steel frame and thick legs that lock into place once folded, you’ll find this ironing board to be an efficient choice. Another feature this ironing board includes is a folding board. Once you iron your foldable clothes, you can use it to perfectly and crisply fold up shirts to tuck away in your drawers. This ironing board is lightweight, easy to fold and you can store this even in limited spaces. Unfortunately, there is no mention of exactly how much it weighs, nor is there any mention of safety features that prevent collapsing. However, the ironing folding board is a nice option for those that have lots of shirts to fold into drawers. For those that have little room to spare or perhaps live on their own, this table top-style ironing board by Household Essentials is just the thing to get your ironing done in 2017 and beyond. It’s fashioned from a frame that is 80% aluminum, making it very lightweight at just 5 lbs. The surface area is 8.5” in height by 12” wide by 30” deep. It’s not very large but offers adequate space to get the ironing done. While it is small in size, it does have a slide-out wire shelf that you can use to put your iron on, preventing it from tipping over of the board. For storage, it offers an over-the-door hook which allows you to stow it away easily. The cover is 100% cotton and features a thick 5mm fiber pad underneath for a smooth ironing surface. If you live in a small apartment, dorm, or don’t have much ironing to do, this is the best option. It takes up little space and is easy to stash away. 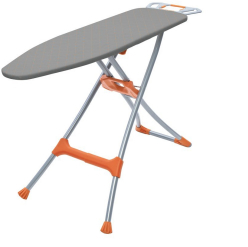 It doesn’t have any safety features for collapsing but people who choose this style of table top ironing board generally don’t have children. The ironing space on the board is sufficient to get things done, however it is much smaller than the larger, stand-alone ironing boards. If you have a lot of ironing to do daily or weekly, that’s one thing to keep in mind. 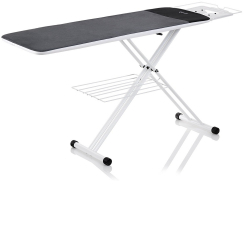 Homz Durabilt ironing board gives you ample ironing space with a 54” x 14.875” ironing surface. A mesh top allows for easy steam flow as you iron, plus you can adjust it in regards to the height up to 39.5”. The legs can be expanded to 25” wide, making it a very stable ironing board. It also includes an iron rest that gives you options. It has hanger slots with silicone padding that helps absorb the heat. It also has angled support to keep the steam from flowing when you’re not using it. Additionally, it has an integrated garment hanger. You can press your shirts and then instantly hang them up without having to venture off for hangers. A quick-release paddle on the side makes it easy to fold down the ironing board in a jiffy. It also has a handle allowing you to carry the ironing board with ease for when you stow it away. The ironing board itself has a 100% cotton cover with ¼” foam padding along with a ¼” polyester fiber padding for smooth and cushioned ironing. It’s sturdy at 20.4 lbs. It’s made in the USA, which is also a nice advantage for those that like to buy American. It’s a very sturdy & best-rated ironing board, however, it makes no mention of safety lock features for both preventing collapsing or staying in place once folded up. This could present a problem for those with small children. The iron rest is better than standard though, helping you keep from wasting steam while not using the iron. It’s also convenient to have the integrated hanger to use for things you’ve just finished ironing. Reliable has created what they call “the world’s first and only 2-in-1 home ironing table.” As of 2017, it’s the only model of ironing board with this 2-in-1 feature. It offers a large 18.9” x 47.25” ironing surface that has an extension piece that can bring it to a 55” surface for both larger items as well as for those that enjoy quilting and knitting. This ironing board comes with an iron tray that perfectly stows your iron when not in use as well as a laundry rack which offers the convenience of doubling as a catch tray when needed. The covers are fashioned from cotton and polyester to provide smooth and easy ironing. One is standard size while the other cover included is for the longboard version when you fully extend it. The framing is heavy duty with what they call a “double wishbone leg design” created to keep it from wobbling as you work. It’s sturdy at 29 lbs, and folds up with a magnetic locking system that keeps it in place, making it easy to store. The ability to extend the board to accommodate larger items is a big bonus. If you are into knitting or quilting, this is the best ironing board for you. While it is very sturdy, 29 lbs. makes it a bit more cumbersome to move around. 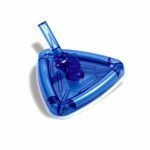 Additionally, while easy to open and expand, you’ll need to change the covers which can leave opportunity for bumpy, uneven ironing surfaces if you’re not careful. Homz brings you this T-Leg Ironing Board that features a 53” x 13” ironing surface. 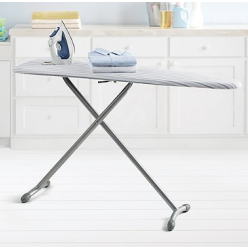 With plenty of space to iron even when it comes to larger garments, it also has a foam pad with a 100% cotton cover that fits tight to give you a smooth surface for ironing. You can adjust it easily in height too, to any height you wish up to 35”. The frame is very sturdy, made from a durable metal. It features a leg lock with a patented design that allows it to easily collapse when triggered for putting away when not in use. It’s a lightweight ironing board that weighs just 9.6 lbs. Proudly made in the USA, this ironing board for 2017 is the best choice. it’s flimsier than other ironing boards. It also makes no mention of an iron rest, which for 2017, is a big safety feature that most people want whether they have children or not because of the dangers a hot iron can pose should it topple off the board. The leg lock does keep it secure from randomly collapsing, though, but with such little heft, this board is much easier to tip than others. It is versatile though as far as height adjustment, giving you many options for height. Ironing boards for 2017 should be equipped with the best safety features to keep people in any household safe. Boards that have an iron rest and a secure way to open and close it with ease are the best bet. That is why we liked the Brabantia model the best. It had everything including a wide surface area, an iron rest, and safety features, plus it was sturdy and free of wobbles. Consider your needs when buying an ironing board. If you have children or pets, choosing one that won’t randomly collapse is imperative. 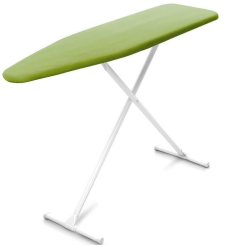 One with an iron rest is safe for everyone, however, if you live in a dorm or small apartment on your own and have little to iron, a table top ironing board may be best suited to your ironing needs.